A lil about myself… I’ve been playing ML since season 1, I’ve seen almost all sorts of changes throughout the game… some good and some bad meh.. I’ve been lurking in the reddit for quite sometime now, so I figured I should do something for the community. Well my main goal is to show everyone that older units are still viable even at the current meta.. I figured I might as well do a short write up on Alice first since she was my first main before kagura came out hehehe. A Little About Alice The EVIL One! Thousands of years ago, the humans defeated the Blood Demons and imprisoned their queen Alice in the dark abyss. Today, the land of dawn faces a huge disturbance and the seal’s power has slowly weakened. Alice’s main role in the game is an Engager/Sub-damage dealer. She’s made for teamfights and playing with a team, she’s one heck of a lane harasser, and a better engager, by timing her skills perfectly, you’ll pretty much take the opponent by surprise and take a huge chunk of HP from them. She has more Sustain and Residual damage, and is known for her abilities to stay in the fight for a longer period of time compared to other mages. The main aspect of mastering her is to learn the distance of her 1st skill and when to engage and disengage from a teamfight. When a nearby minion dies, a blood orb will generate, Absorbing the blood orb will increase Alice’s HP by 10 pts permanently. The more you collect the more hp you will have at the end. Shoots a blob of blood in a specific direction dealing 350 pts of Magic Damage to the enemy. Afterwards when the hero proc “1” again, they will instantly teleport to wherever the blood blob is. Deals 270 pts of Magic Damage to surrounding enemies and trap them for 1.2 seconds. When trapping effect ends, the enemy will get slowed down for 2 seconds. Incorporate this skill into your “3” to create a combo, will be talking more about it in the combos section. For the next 4 seconds after using the skill, the blood princess(Queen) will be in blood-drinking mode, dealing 160 pts of Magic Damage to surrounding enemies every 0.5 seconds and restoring 40 pts of HP for herself at the same time. Try to always proc “2” before your “3” when you teleport in, however I found that proc-ing “3” right after initial “1”, than proc-ing “1” to “2” being more effective. I’ll be explaining how this work in the Combo’s section below. Having high sustain doesn’t mean you are invincible, always be prepared to run when you think that you’re in danger. Make use of your “high damage” output in the early games to gank with your teammates, giving you guys the clear advantage. Note that the range of “3” is similar to “2” so take note of your range. It is one of the way to perfect her. *Note: I’ll be changing the format of this section too, do let me know which format you like more and I’ll stick with the format. hit a pretty high amount of Magic Power once it’s fully charged. Replaceable: [Enchanted Talisman] – If you think you need more Mana instead of HP feel free to buy Enchanted Talisman instead of Clock of Destiny. *However I’ve never faced any troubles with Mana when playing Alice that’s why I didn’t include Enchanted Talismans in my builds. Replaceable: [Arcane Boots, Magic Shoes, Warrior Boots(Popular Choice)] – If you like more Magic pen, Arcane Boots is for you. If you prefer having a more CDR Magic boots would suits you, though with the low cool down on both your “1” and “2” I don’t really use CDR items, I mainly build damage Hahahaha! Warrior Boots is a more popular choice since you usually get attacked when you engage, it would give you additional armor as you get attacked by physical attacks. It helps you last longer in a team fight. 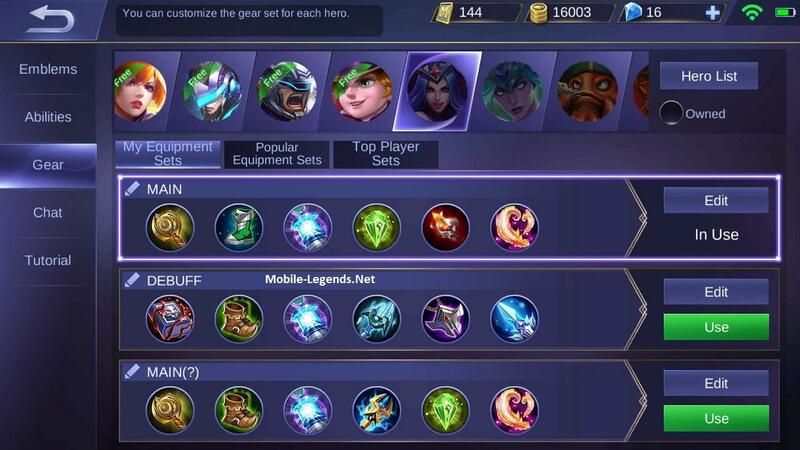 Reasons: Another core item that gives you the most sustain in teamfights. Usually I’ll get this item as my 2nd item even before the Boots lolol, but that’s just me. If you like to have a little more Mvmt speed get the boots first. Replaceable: None – This item is pretty important in my honest opinion, I don’t think any other item can give you enough sustain on a teamfight other than this item. Reasons: If you haven’t noticed already, I really like Holy Crystal since it has one of the highest Magic Power in game and it’s unique passive gives quite a boost in damage. It’s one of my favorite item to throw in my mage builds. Replaceable: None – Not many items will be able to allow you to spike your damage so I’ll stick with this item too if you really really hate this item, you could consider Fleeting time or Enchanted Talisman for the CDR and respective unique passive though like I’ve mentioned above I don’t really have much problems with Mana and Cooldowns so I don’t really use any of them. Replaceable: Necklace of Durance – If your team is having troubles with Marksmans/Fighters with their insane lifesteal or even Estes, please use this item instead of Glowing Wand, This item cuts their heals/regen by giving your team a better chance in a teamfight. Even if they don’t give you much troubles, getting this item could still give your team an advantage in teamfights. Reasons: The one item with the most Magic Power and HP, one of the better late game item for mages. With the unique passive from this item, would give you more HP than you could imagine, it helps you with your sustain during late game fights. Replaceable: None – No other item gives you this much Magic Power and HP, it gives you the Magic power for your Spell Vamp and the HP for sustain. If you really really hate this item… Just use it why would you drop this item lololol.. This is one of the troll builds I’ve made kekeke, it’s best when you use it when you’re playing with friends and want to troll a lot. This build’s main goal is to apply as much debuffs as possible so that your teammates can take the enemy down fast. It’s a build that doesn’t give as much damage compared to Build 1 but it’s hella annoying compared to Build 1 lolol. *Note: I won’t be giving any suggestions on other items since this is a troll build lolol. Give it a try and figure out different builds that might work in trolling. Reasons: Sustain more Sustain need I say more? LOLOLOL, this item works best with your “3” keep it so that you can stay in the battle longer. Reasons: Like I’ve mentioned before in Build 1, This item is perfect for killing enemies that uses a lot of lifesteal or Regen. One of the best item to throw your enemies off their “rhythm”, and thanks to your sustain from “3” and Concentrated Energy, you’ll be able to apply a constant debuff whenever you engage, giving your team a chance to clean up once they are caught. *Note: Did you guys notice why I didn’t include Ice Queen Wand in my main build? It’s because, your “2” already trap/slows them for a total of 3.2 seconds which is about 4 seconds, this item only works for 3 seconds which is practically useless since you’ll be popping your “2” right before “3” for maximum damage. You don’t really need Ice Queen Wand, there are better items for more damage. The only changes made are to the Boots and swapping Glowing Wand with Lightning Truncheon. Making use of LT’s sudden burst of damage, instead of the residual damage you’ll be able to give your opponents a scare, and with LT’s passive it will give you a better minion clearing speed near end game. After testing both builds, I kinda fell in love with Build 3 and kinda stop using Build 1 LMAO. Alice Combos – Blood More Blood! Finally we’re here, the place where most of you are interested in. 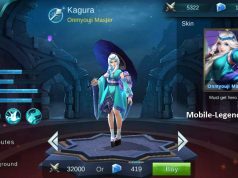 First things first, she’s not as complicated as Kagura, so I won’t go as in depth as my Kagura guide. (“1” > “1”) This is the most basic combo you have to engage and to escape. Proc “1” to shoot out a blob of blood. Proc “1” again to teleport to the blob. Make sure you gauge the distance before teleporting over. If the blob disappears you won’t be able to teleport. Do not teleport into the “wild”. Make sure you know what’s happening or you can see what’s happening before engaging… Engaging mindlessly or blindly is called suicide. Always be prepared to run with your “1”. Take note of how long your “1” can travel is the way to master the art of running using Alice. (“1” > “1” > “2”) This is the next Combo you have to learn. This is similar to Combo 1, but you’ll be incorporating “2” into your Combo, to trap your enemies. You can proc “2” before you run away with “1” too, to trap your chasing enemies for awhile. Something like (“1” > “2” > “1”) -OR- (“2” > “1” > “1”). You’ll have to gauge the timing yourself and make sure you do not proc “1” when the blob is over a wall. (“1” > “1” > “2” > “3”) This would be your highest damage combo and your best engaging skill, people usually run or gets the blood sucked dry LOLOLOL. Much like Combo 2 or 1, you’ll be teleporting into the mess and hitting your “3” to damage your enemies or disrupting/breaking up the fight. You’ll usually die at this place, however please take note of an escape route where you can throw “1” to escape. Since your “3” last 4 seconds, be prepared to run after your ult ends. I like to use, either Magic or Magic Assassin Emblem sets, it depends on which one you have at a higher level, personally Magic assassin is more prefered. Due to her nature of being a DoT hero instead of burst, you can consider running Tank Emblem too. Personally I find Purify the best due to her being the engager, it’s always good to have a way to get out of CCs. Personally I like to go either top or bottom lane, since I can’t be bothered to argue with MMs that wants Mid Lane, but if you can go Mid, GO!!! THOUGH, to note, even though they are recommended laning partners. You could pretty much lane with anyone as long as they can do what they are supposed to do. It’s usually about how you deal with the opponent and not who you could pair with. Though you definitely would have an easier time if you’re laning with them. Heroes with Low burst skills, Usually Tanks and Fighters, With the capabilities of your “3” and how much spell vamp you have, heroes without huge burst of damage will have troubles taking you out, though do note that with enough time you’ll still die since your “3” will run out. *Making myself clear, Burst as in ONE HIT WONDERS LIKE EUDORA* Fighters generally has very consistent high damage throughout like Marksmans. Generally heroes that lacks Mobility. Like Layla or Bane, as long as they couldn’t get out of your “3” Range they will pretty much have their HP drained by a huge chunk. However do note that as Alice is made to be an initiator, you’re meant to be in the middle of the team fight and having all sorts of heroes in there, it’s very hard to avoid enemies you don’t want to meet. So do take note of when you engage and when you don’t engage. 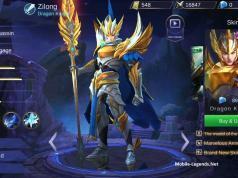 High Burst heroes, namely Eudora, Aurora, Karina. ETC. So long as you don’t survive burst skills, you won’t be able to pop your “3”. Even though you’re an initiator, you must note that you’re still a mage, not matter what you’re still fragile. Heroes with bulk. Like Hilda or Chou or Balmond. If you aren’t able to take them out or lower their HP, you’ll be pretty much dead once your skill goes on Cooldown. Heroes that are tanky and does a decent amount of damage are the bane of your existence. There are a few other heroes that you do have to be careful of like Natalia’s Silence, however do note that Nats kinda checks almost every heroes with her Silence lolol. Alice may be a sub-par mage during SoloQ or even 5 man fights compared to mages that has a higher burst damage. 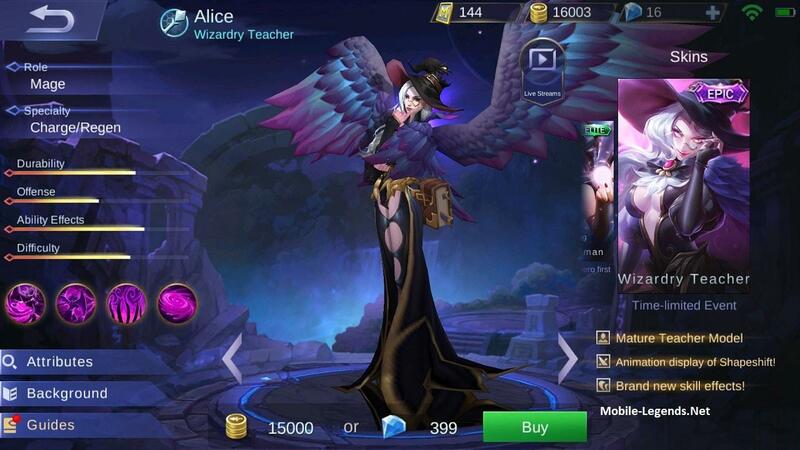 However during teamfights Alice has one of the best sustain as a mage and one heck of a damage when initiating, this would prevent enemies from trying to engage or trying to fight it out. Like I mentioned above she is not like any other mages, she is more of a teamfight hero than a click to kill hero, this hero requires map awareness and instincts to master. Knowing when to engage and when to disengage. One last tip before I end this guide, do not start unnecessary teamfights, when your team isn’t nearby or ready. Always think about your enemy’s position and your team’s position. She works well with a team but doesn’t mean she’s bad for SoloQ-ing. Thank you for sharing “-GoW-Basara“!